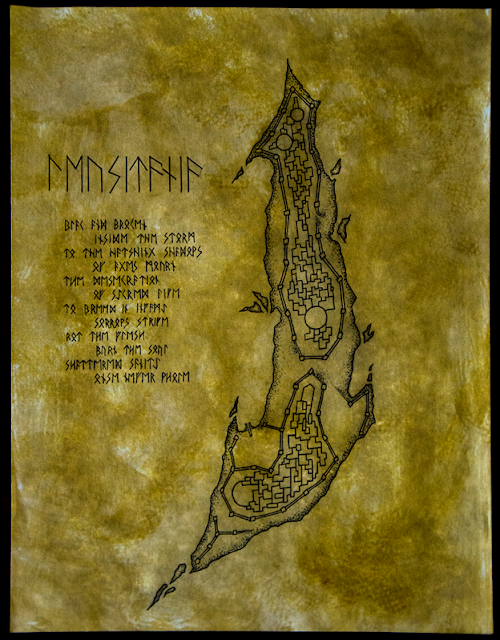 For more years than I can remember, I have had a fascination with maps and the mysticism that goes with them. 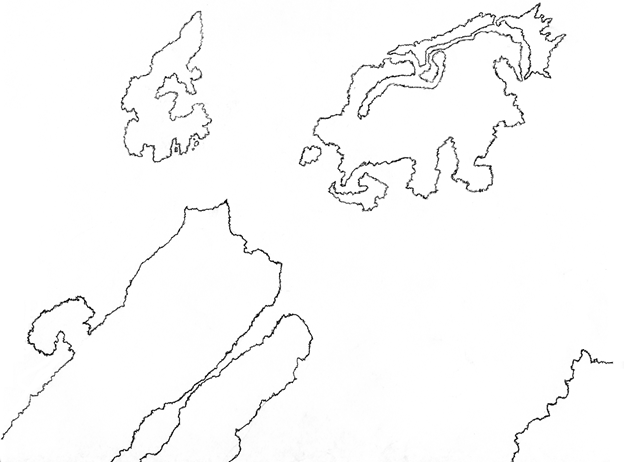 Whether representations of actual geographic locations, recreations of fantasy worlds, or things I completely invent, there is something about drawing maps that has its own transfixing qualities about it. In the beginning, many many years ago, I began drawing buildings on some .25" square graph paper. At the time, and I think I was about around 10 then, they were awesome. But then I realized how ugly they really were. At this point I realized that I was not an architect, and moved on. 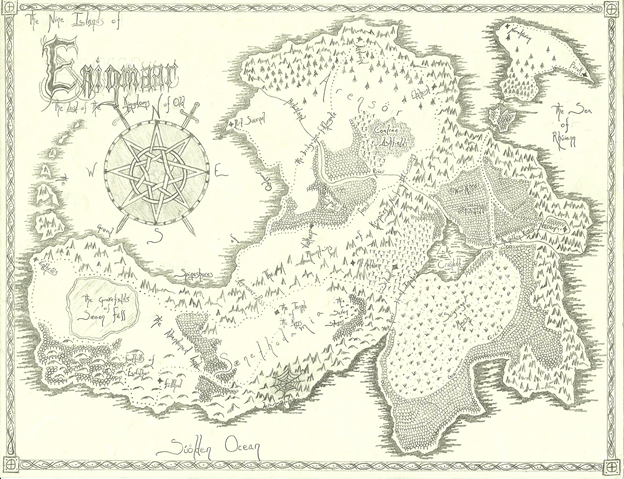 From there, I really began to delve into cartography. However, I was still stuck on the primitive techniques and uninteresting style. However, only scraps remain of those older years due to an incident three years back where I was stopped for the night in the middle of a 16 hour drive. I happened to have all the maps I had ever drawn in the car. It was Friday the 13th, for the superstitious folk out there, and the van was broken into. Of all the things taken, most of them were replaceable, all save the maps. The worst part to me was that to whoever stole the backpack they were in, they were worthless. But to me, they represented nearly a decade of work. So now, all that remains of those years if the few scans I have of them from one project or another. For the above image, I used simple notebook paper and the old wooden pencils (in the age where mechanical pencils were somewhat of a novelty). The result is quite obviously sloppy and bland. Given this did not get that far, it still shows how simple the approach really was. 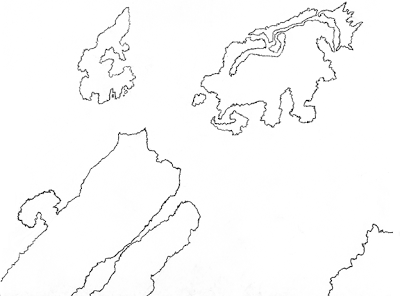 A year or so after that, I tried a different way of drawing shores, which was about as far as I ever got before losing interest in the particular geography and starting something else. 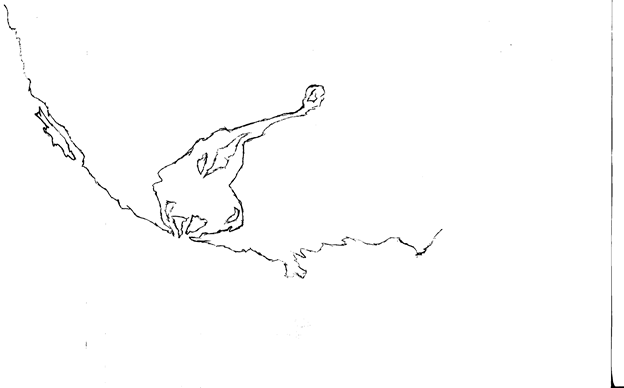 The idea was to make a jagged looking shoreline such as centuries of erosion would cause. However, I soon realized that such land features would not appear on such a scale. Another reason this style did not last long was the repeatability. Slight differences from one day to another made significant discrepancies in the appearance. 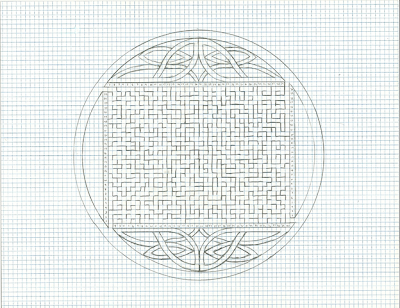 For a brief period, I had a fascination with mazes and the idea of the labyrinth. 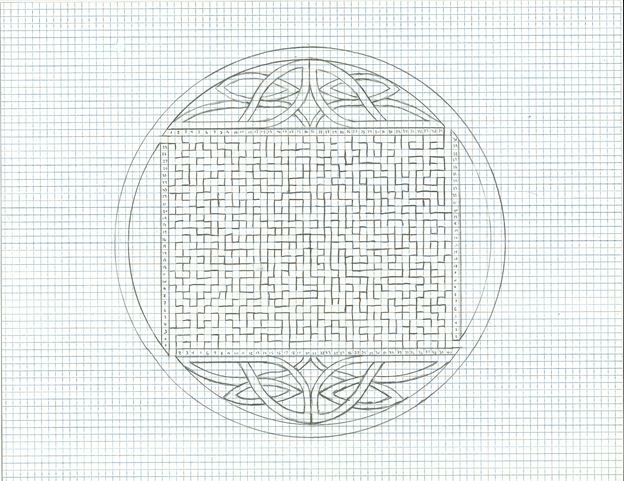 It was a fun notion to entertain, but computers are far better at creating random mazes faster. I am not entirely certain what to call this, but it was a take at subdivided statehood or something, and this was the only time I ever tried it. I realized too late that the divisions were far too small to be practical. 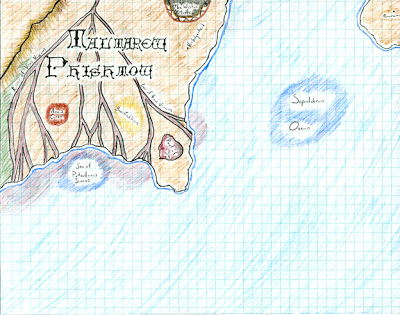 This point, in my mind, is when I really began to develop my skills at map making. 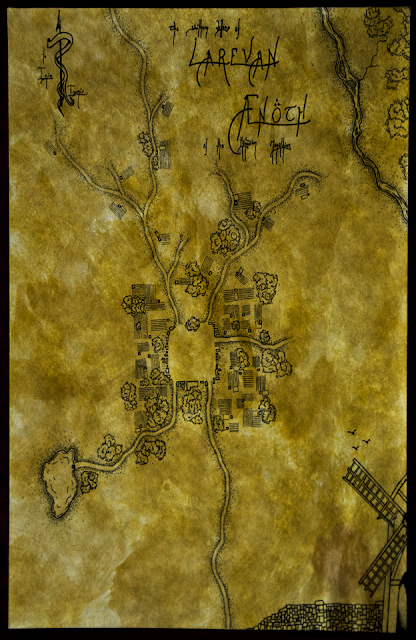 That is not to say that I had skill at map making, but marks the time when things began to evolve rather than change entirely. First, and most obvious, there is colour here. At the time, I thought it would be neat to use blue for the oceans, green for the forests, etc. While that did not last, it is still something I think about returning to. The paper, for whatever reason, is the same as when I first started. I had some errant notion that it was superior in some way. The back is lined, and I wrote brief descriptions of the places on the front. Since these maps, I have not used it since. In many ways, there is nothing spectacular about these. The forests are slashes of green, the mountains a disgusting ridgeline. One thing, however, that really sets these apart is that the maps are populated. 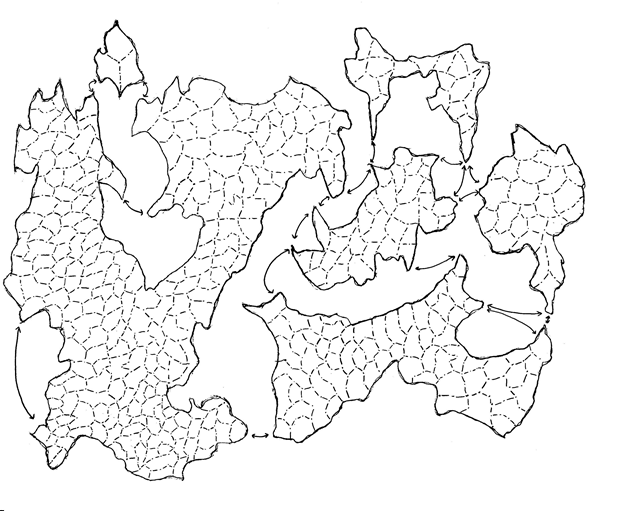 That was new, and probably what makes me consider them the true starting point in my practise of cartography. A year or so after the colours appeared, I discovered the works of Daniel Reeve. 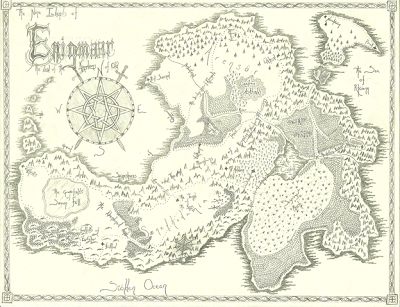 For those of you who are not familiar, he illustrated Middle Earth amongst other things. 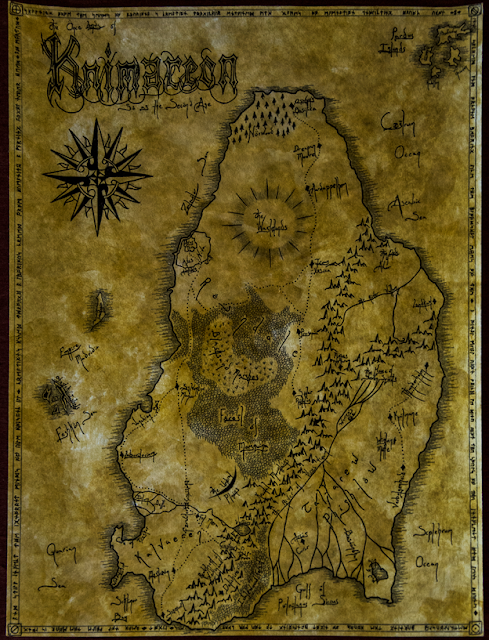 The fantasy and old-age style of map is what I have turned towards ever since. 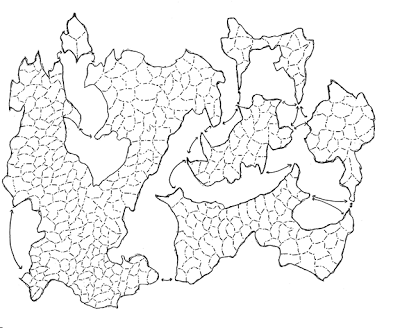 Mountains represented as mountains, trees as trees, there is something so simple yet visually dynamic about these maps. As an aside, I would like to note that the paper, although graph paper, is not the same as the previous image. Now, it is immediately obvious how different this is. A few things here that I would like to note. The lakes are in the Daniel Reeve style, concentric rings following the rough shape of the shoreline. He can pull it off, but me not so much. Another thing is the lettering. I based this off of a medieval lettering guide I received in my 6th grade history class. For this particular map, it works. That however is the last time I ever used it. In the spirit of really developing my own style, I turned to my natural script that I have heard resembles tengwar. A few more years passed and I went to cotton paper for the visual appeal. Although it is not easy to see in the poor quality picture above, it has a cloudy look that resembles parchment. Also, the water is marginally different. 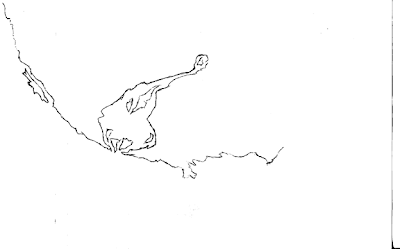 I used a series of jagged lines close together to give the appearance of water. I used this in the lakes too. 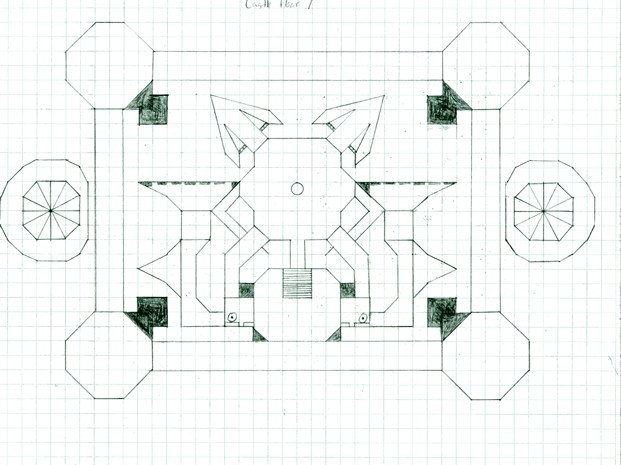 Most of the things I did in the maps from this era I use to this day, although with some refinement. It is, for a recreational drawing, not too shabby. However, looking ahead I remember a time in my childhood where a good friend of mine found all of the old maps his father drew a good many years ago. Seeing those and knowing that they were still around after years and years of lying in wait, I began to wonder what would happen to mine. If/when I ever have kids of my own, I want them to someday come across the things I have made and see them how I always imagined they should be seen. On the exception of it turning out strange in the picture and scaling down the size, this is where I currently sit. By the recommendation of Scott Roush at Big Rock Forge, I have started drawing in India ink, an archival ink that lasts forever and never fades. Part of the reason I thought my maps were lacking was the nature of graphite to fade over the years when left exposed. Another thing, rather obvious, is the difference in paper. In fact, it is the same paper as the previous one, only it is coated with an amber shellac. It brings out the patterning of the cotton and gives it an almost parchment feel. Although in the picture there are several white spots, it does not look quite like that. The result is a high contrast, old style map that will last virtually forever. As I enter into the next chapter of mapmaking, it is with the wonder of what will come next after having come so far already. 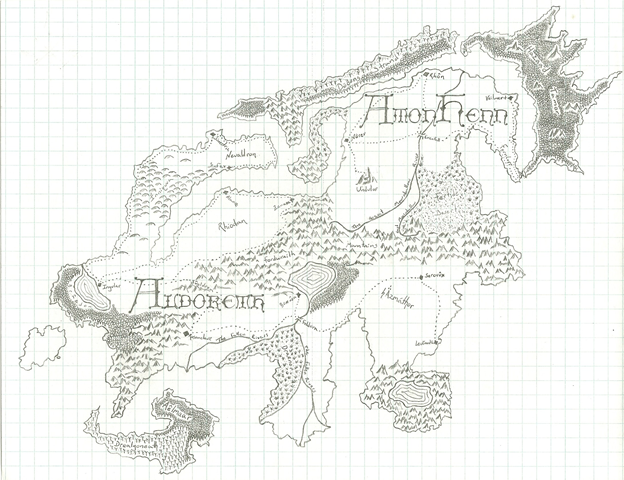 I can, after all these years, finally draw maps that I am content with.